The SQL Server database engine automatically generates the next value for use by the IDENTITY column on a table. This often leads to a misconception that IDENTITY columns always contain unique values. As can be seen from the script above, we were successfully able to insert duplicate values for the IdentityId column in the table. Also, the current IDENTITY value continues to remain 3 although there are about 5 records inserted in the table. The DBCC CHECKIDENT can be used to get the current value of the IDENTITY column value. By default, this DBCC statement does not reseed the IDENTITY column. However, if the RESEED parameter is specified, it allows the administrator to reset the “seed” value of the column to any value supplied (Refer the Introductory Post for a refresher). Checking identity information: current identity value '3', current column value '1'. A long time ago, I wrote about the BCP utility being an underappreciated feature of Microsoft SQL Server. As is the case with all columns in SQL Server, uniqueness can only be guaranteed by the use of a UNIQUE constraint. Without the constraint, IDENTITY columns may end up having duplicate values. Often, applications and T-SQL code use IDENTITY columns as a unique sequence of numbers – this should be done with due care as duplicate values may cause the code to break. 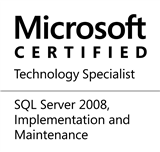 This entry was posted in #SQLServer, Blog, Imported from BeyondRelational and tagged #Identity, #SQLServer, #TSQL, DBA, Development, Myths, Series, Tips on June 4, 2013 by nakulvachhrajani.